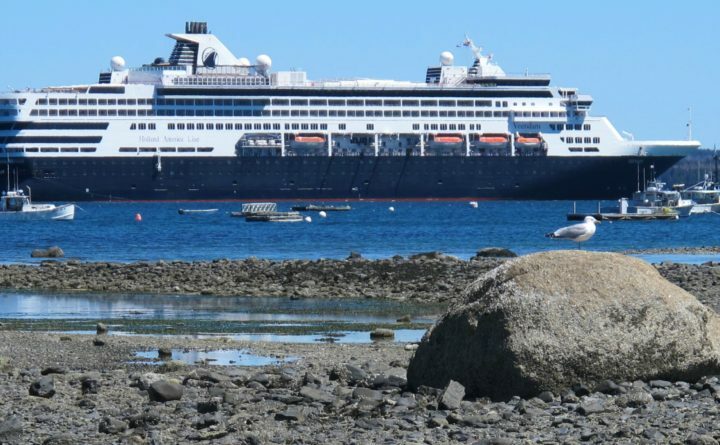 In this April 2016 file photo, a sea gull stands Friday on a large rock on the sand bar in Bar Harbor while the Holland America ship Veendam is anchored in Frenchman Bay. 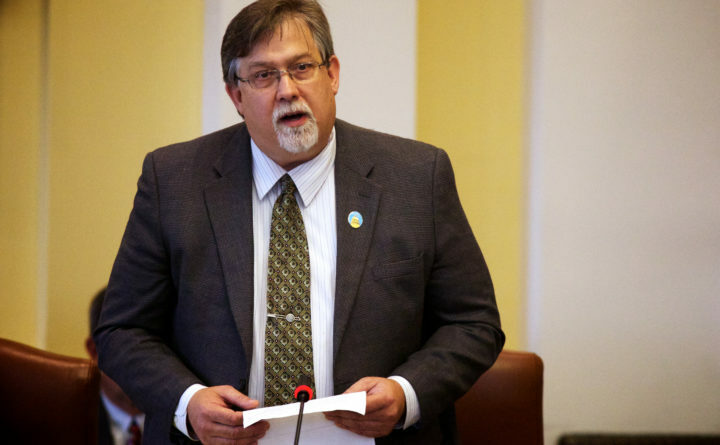 — A bill proposed by Senator Brian Langley, R-Ellsworth, that would create a Bar Harbor port authority, won qualified support from the Maine Senate on Thursday. A bill giving Bar Harbor residents permission to form a port authority — should they vote to do so — won qualified support from the Maine Senate on Thursday. The Senate voted 25-9, with one excused, to pass LD 1400, An Act To Create the Bar Harbor Port Authority The bill now moves to the House for a vote there before facing further consideration in the House and Senate. All nine senators who voted against the bill are Democrats. Some of the opposing senators said that some Bar Harbor residents did not want a port authority because they feared it would lead to the installation of a cruise ship pier at a former ferry terminal off Route 3 that the town intends to buy for $3.5 million. Sen. Shenna Bellows, D-Manchester, who grew up in Hancock, noted recent College of the Atlantic opposition to a pier. Some senators voting in the majority, however, spoke against the precedent that would be set if they voted to override a committee recommendation — in this case, a Transportation Committee report on Jan. 30 saying that the bill should pass as amended to allow a local referendum. The bill, among other things, requires Bar Harbor voters to decide whether to form an authority — a local decision that state government should not meddle in, they said. Bar Harbor town councilors have supported the bill, saying it merely gives residents the option of choosing a harbor authority as town officials work to improve town and harbor traffic flow. Tourist traffic has become Mount Desert Island’s biggest issue in the wake of a record-setting number of visits to Acadia National Park, 3.5 million in 2017, and resident complaints of seasonal overcrowding. Acadia officials are developing a traffic plan due for release later this year. A council majority has voiced support for using the terminal as a multi-use marina that would allow more space for harbor users and town visitors. Councilors have objected strenuously to the idea that a port authority or the terminal purchase represent a back-door attempt to create a cruise ship pier. A specialist hired by the town is reviewing how to best fit the terminal into a town-wide business and traffic plan. Bar Harbor voters will have the final say on the $3.5 million purchase when they vote on a bond in June. Correction: An earlier version of this report incorrectly stated that the Transportation Committee issued a divided report on LD 1400. The full committee endorsed an amended version of the bill.